Molly is just like any other girl when her family moves to Horseshoe Bay. 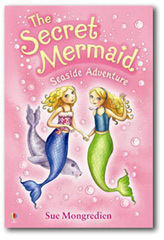 But then her gran gives her a pretty shell necklace and Molly is amazed to discover it is enchanted… and that she is now the secret mermaid. 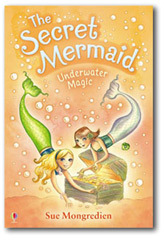 Molly can’t wait to return to the Undersea Kingdom as a secret mermaid. Swimming with dolphins and diving for treasure is so exciting! 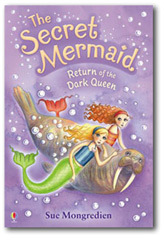 But first, Molly must help her mermaid friend Ella find her missing enchanted shell – before it falls into the Dark Queen’s evil clutches. Molly’s thrilled when she and her mermaid friend Delphi find another piece of the magical conch shell, but unfortunately a grumpy sea urchin has made his home on it, and won’t move! He’ll only swap it for the pirate treasure that lies in a nearby shipwreck… but what other dangers might be lurking there? 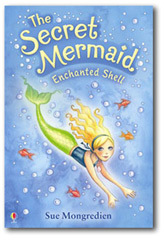 Molly must venture into the ocean’s darkest depths to help find mermaid Pearl’s missing shell. 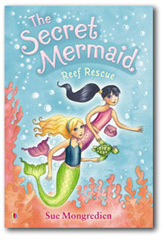 They know the Dark Queen’s sea snakes are on the prowl but nothing can prepare them for the discovery that Pearl’s shell is inside a huge underwater volcano – a volcano that could erupt at any time! 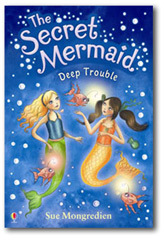 Watch out for more Secret Mermaid stories coming in 2010!